Growth story continues to lift equities, but faster growth is beginning to stir concerns over rates and inflation. 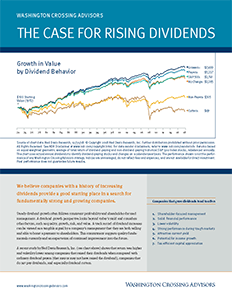 We have seen constant upward revisions to earnings and growth estimates for the last year, creating the backdrop for good equity market performance. A combination of easy monetary policy, improving growth, and strong sentiment are driving continued upside surprises for growth. Leading economic indicators remain strong, employment trends are solid, business investment is picking up, and order rates for durable goods are surging. 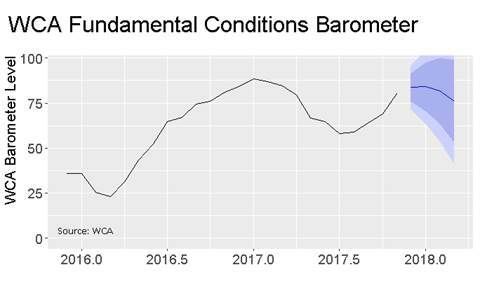 Our own WCA Fundamental Conditions Barometer (below) surged through the later part of 2017 as tax cuts became factored into the outlook for growth. In short, there continues to be good momentum behind a long-running string of upgrades to the global economic outlook. While all of this good news has added to the case for stocks, it also carries with it reasons for some to worry about higher short-term rates. A recent rise in both the two-year Treasury rate and consumer price inflation to above 2% has increased the potential for more aggressive rate hikes by the Fed, something not currently anticipated by markets. The chart below shows a measure of the expected policy rate changes based on the forward market for the Treasury rate. In this analysis, we subtract from the current 1-year Treasury the same rate an investor could “lock in” one year from now in the forwards market. The main point is that when this spread rises, as has happened recently, it reflects a rising expectation for faster rate hikes ahead. 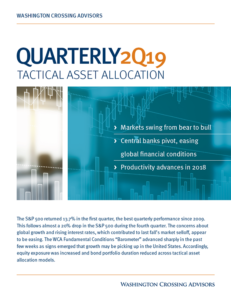 A bearish argument contemplates excessively strong global growth leading to capacity constraints, higher inflation, and a rapid series of rate increases leading eventually to a recession. Those in this camp will tend to look at capacity constraints in the real economy and the long duration of the business cycle as reason to fear a pickup in inflation ahead, along with aggressive rate hikes. With 80% of countries now generating output higher than what many economists consider to be “potential” output, and with the unemployment rate in the United States and Europe at very low levels, the return of so-called “wage-push” inflation seems like a plausible potential outcome. We are less convinced that “tight capacity” in labor markets will automatically lead to a rapid increase in the price level for a simple reason. There is a very weak historical relationship between the unemployment rate and inflation, and there is little evidence that shows any convincing connection between wage growth and inflation. The “clear” logic of labor tightness leading to inflation is far from clear when we actually look at the historic evidence. The evidence simply does not support the theory — a regression of inflation on the unemployment rate from 1997-2017 reveals a very low “goodness of fit”, or R-squared, statistic of 0.08. If we saw a large amount of new money chasing fewer goods, then inflation fears might be better justified. However, with total outstanding credit growing near the same pace as the real output of goods and services, and with few signs of bottlenecks in the global supply chain, we do not see an imminent surge in inflation ahead. Of course, we will continue to monitor the situation and will modify our return expectations if the facts change. For now, however, we are making no change to our outlook for slow increases in rates. As we said in our Viewpoint 2018, we expect to see good growth this year and momentum could carry the bull a while longer. Our long-run return expectations are, however, lower than they have been in recent years due to high starting stock market valuations and compressed risk premiums throughout many areas of the bond market. Allocating capital between stocks and bonds would be further complicated by a regime shift to rapidly rising short-term rates (our risk case). Even without this risk factor, expected long-run risk-adjusted returns are likely, in our view, to be lower than in the past because above-average valuations and below-average volatility measures are expected to gravitate back toward longer-run averages. This process will create a headwind against which improving growth forecasts must push. 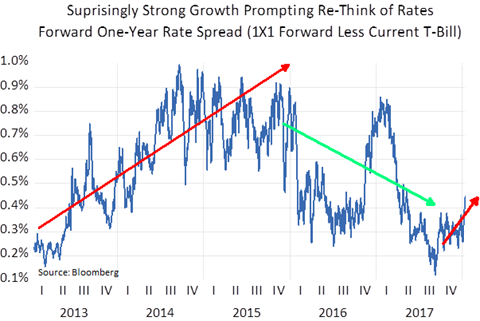 If the nascent uptrend in rate expectations continues, this could evolve into a challenge the market will need to overcome in the months ahead. For now, the improving fundamental growth outlook still best explains market behavior. These new trends in inflation and forward rate expectations take on even greater importance as leadership at the Fed transitions from Janet Yellen’s leadership to Mr. Powell’s on February 3.